“Ridiculous” was my inital thought as my alarm clock went off at 5am. It was already light of course, in fact it never really gets dark this far North so close to the summer equinox, but still wasn’t easy getting up and packing up my tent at this ungodly hour. The reason for the early start was that I had a long journey ahead of me, and Faroese public transport timetables being what they are, I pretty much had to catch the first ferry back from Suðuroy to Torshavn at 7am. It got in just after 9, just in time to catch my connecting bus to Leirvik (whose name comes from the same origin as Lerwick in Shetland, the old Norse for muddy bay). Have to praise the efficient Faroese public transport here, there are only about three buses a day but they are timed to connect with ferries which makes for a smooth journey. The journey to Leirvik on Eysturoy (the island immediately to the East of Streymoy where the capital Torshavn is) involved going through three tunnels. The Faroese have quite an impressive network of tunnels blasted through mountain rock linking communities which historically could only have been done by boat or on foot over the mountains. We also passed through several picturesque villages I was sorry not to have time to see properly. Streymoy and Eysturoy are linked by the Sundini bridge, nicknamed the “bridge over the atlantic”. It doesn’t really compete with the great bridges of the world, is no Golden Gate bridge or even Hammersmith bridge, but saves another ferry journey at least. At Leirvik I did have to get another ferry, to Klaksvik on the island of Borðoy, the second largest town in the Faroe Islands after the capital Torshavn. 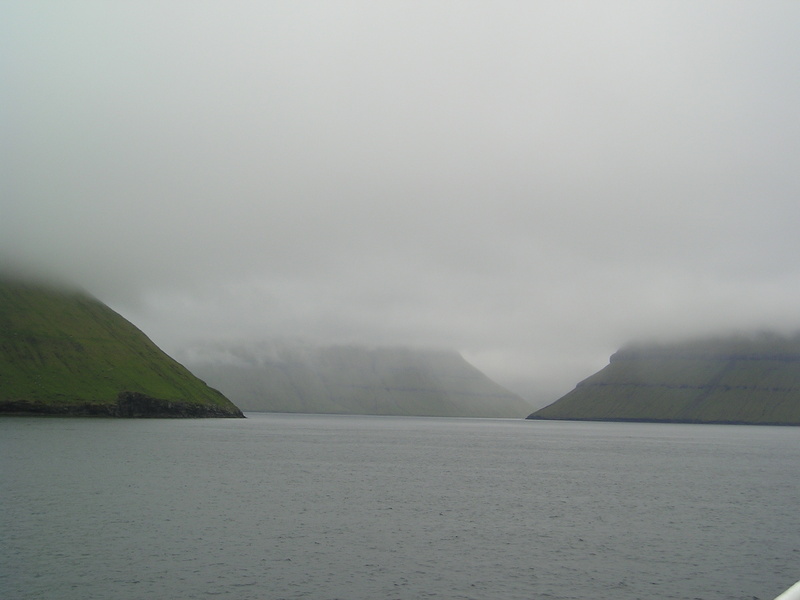 Was a very eerie journey with very low cloud cover (perhaps about 100m) covering the mountainous islands surrounding the ferry (edit: since my trip a tunnel has since been built between Eysturoy and Borðoy). 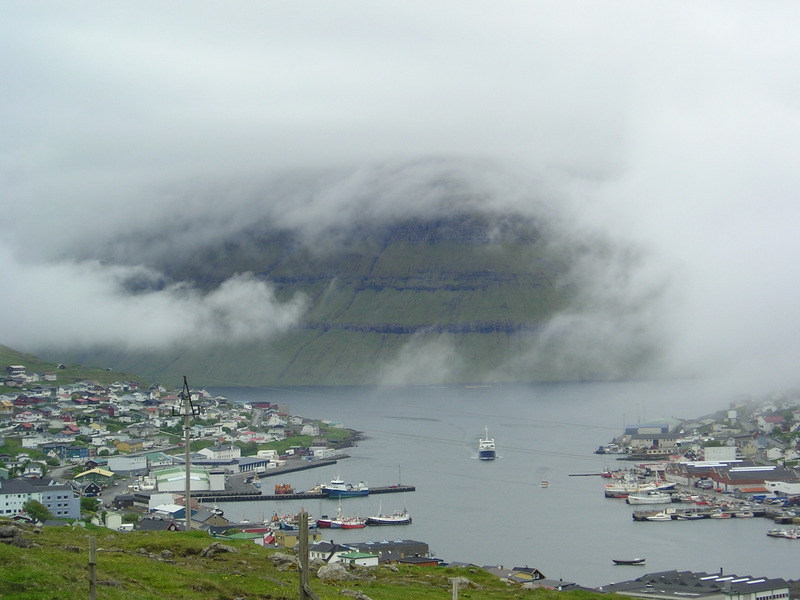 I arrived in Klaksvik at midday, not bad going getting from one end of the Faroes to another in five hours. I couldn’t find the campsite in Klaksvik so booked into the youth hostel where I got a single room for 120Kr. After a few nights under canvas I was chuffed with this – what luxury! Having checking in I set out on an afternoon hike up to Halsur, a mountain pass 245 metres above sea level. It was still pretty cloudy but I got some great views. 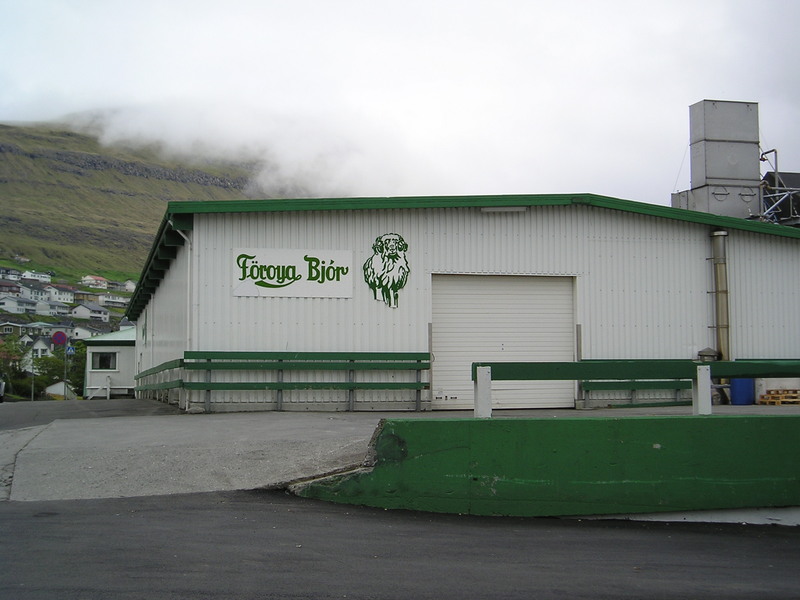 On the way back into town I saw Föroya Bjór, the Faroese brewing company. There didn’t seem to be any kind of visitor centre sadly though, it was just a warehouse. Back at the hostel I turned on my radio and tuned into Faroese radio, who were broadcasting a brass band programme, featuring the Britannia Building Society band. Seems to be a real mix of music on Faroese radio, I’m becoming a bit of a fan. The hostel was pretty quiet, the only other guest I saw was an Icelandic man from the Reykjavik area, he was very friendly although his English was very limited which made conversation tricky. He offered to drive me to the island of Kunoy – drivable from Borðoy via a causeway – which I gladly took him up on. 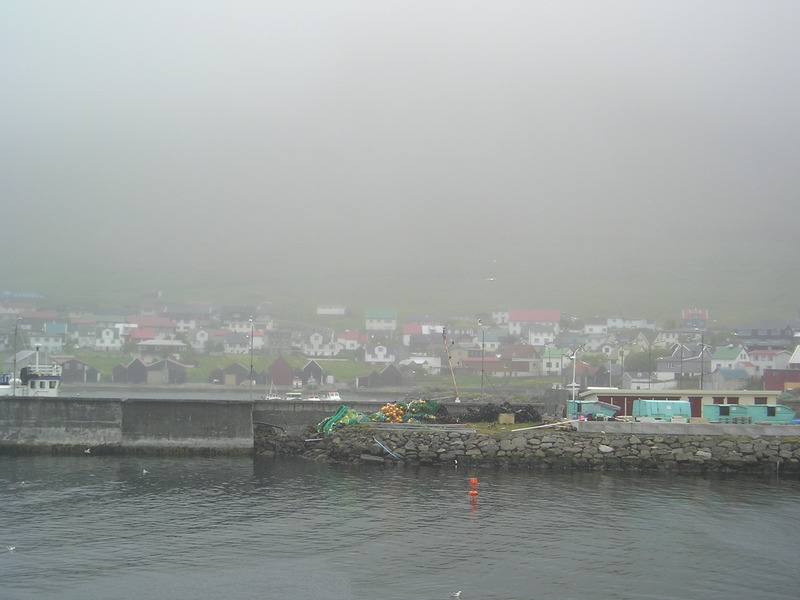 My ferry to Suðuroy (or Sue Roy as I think the locals pronounced it – can anyone help here? 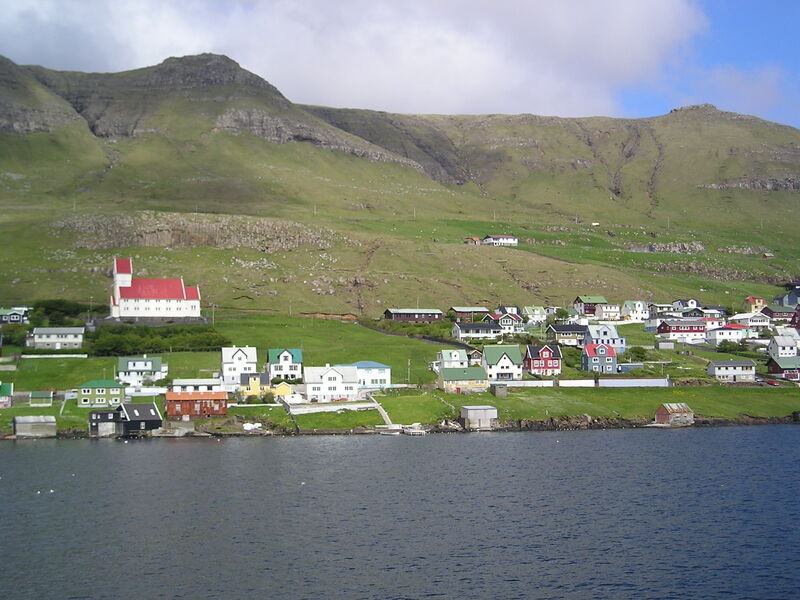 ), which is the Southern most island of the Faroese archipelago, didn’t leave untlil 12:30. This meant I could leisurely pack up my tent at the campsite and have a pretty relaxed morning. Of the 4 other people at the campsite when I arrived, just 2 were left now, a British couple spending four weeks on the Faroes who I chatted to. I was jealous – I’m here for a week which is probably longer than most people get, but wow four weeks would be great. They were cycling round the islands, and as I type this up some seven years on from the trip I’m now massively into cycling myself (in fact I’ve got the highlights from the Tour de France on as I type) and perhaps I’ll have to do a similar trip soon….Anyway I digress. I got to the ferry terminal about 10, and being the Faroes was able to leave my bag on a shelf (not even in a locker) free of charge, and I wasn’t particularly worried about it. No terrorism or theft threat here. I walked up to the Kings Monument, which was nothing special in itself, but did afford a beautiful view over Torshavn. My ferry was called the Smyril, and used to be on the Smyril line going all over the North Atlantic. Now it just did the journey between Streymoy and Suðuroy, and was looking pretty tired, and is due to be replaced. The 90 minute journey was stunning, and worth doing just to see the small islands of Stora and Litla Dimun on the way. 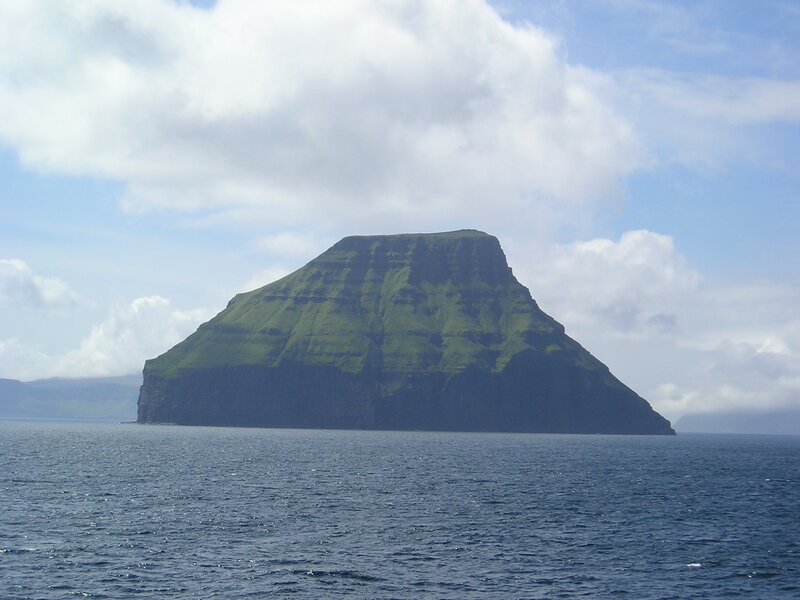 Litla Dimun was particularly impressive, a tiny island, just a mountain top really sticking out of the ocean. There used to be a farm on the island and it was home to around 15 people, but is now deserted. Upon my arrival at Drelnes on Suðuroy I got the bus to the hostel in Øravík. Apart from a couple from Torshavn staying at the guesthouse next door, it was completely deserted. It was now about 3:30 and I set off on a walk to Famjin, home of the first Faroese flag, but the terrain was heavy going and my feet were still aching so I didn’t make it all the way. Back the hotel I got a takeaway pizza (it’s a bit of a weird setup with a combined youth hostel, guest house, hotel and pizza counter, I guess this is the way to do it in such a remote place). I watched a little Faroese television, some kind of quiz show was on. I feel I could’ve planned this Suðuroy trip a little better, I’ve spent a lot of time hanging around today, and have got a very early start tomorrow to catch a ferry back so feel like I haven’t really given Suðuroy a fair go. It’s now 8 o’clock, there’s noone else here and I don’t fancy sitting at the bar on my own so it’s probably an early night, especially with my early start tomorrow. Still at least I made it here, albeit breifly, and it gives me a reason to return one day. I’d like to visit the village of Tvøroyri and also go right to the South of the island.